Have you ever gotten to the end of your week and realized you were short on meat? Or you simply forgot to defrost the ground beef you meant to use for tonight’s dinner. No worries, we all have a few cans of tuna in our cabinets, right? Turn plain, ordinary canned tuna into a delicious entree for your family in just minutes! This recipe uses ingredients you typically always have on hand in your refrigerator and pantry, even if it has been way too long since you set foot in the grocery store. Although it is definitely a frugal meal, it doesn’t feel like one. Who doesn’t like a cheap meal that doesn’t taste cheap? Open up all of your cans of tuna, drain the liquid out, and place the tuna in a bowl. Break up the big chunks so the tuna is all roughly the same size. This recipe is very versatile. You can give larger portions and serve 4 people 2 patties each or use it as a side protein over a big salad and serve 8 (if you are trying to stretch things out a bit!). I’ve also shredded some zuchinni into it a few times and the kids still gobbled it up (be sure to drain all the moisture from whatever you add in!). Tuna goes on sale all the time, so I always make sure to stock up and keep all the ingredients on hand to make this delicious, quick and easy frugal meal! Heather is a wife and mom of 2 living in the great state of Texas! You can always find her carrying on about great deals and frugal living on her blog Family Friendly Frugality. What size can of tuna do you use for this recipe- smaller or large ones? Ditto the question regarding what size can of tuna is used for this recipe? Thx! So sorry! It’s the 5 oz cans! This looks so much better than the tuna cakes I have been making! For the tuna, a great tasting sustainable 5 oz can is from Wild Planet Foods. They have albacore and skipjack and all their fish is sourced from the North Atlantic, meaning half the mercury of the national brands! I can’t wait to try this recipe! I love tuna but have trouble getting my kids to eat it. BUT, they always like fried food better…Thanks!!! I have tried many tuna cake recipes and they never turned out right. So glad I found this 1 my kids inhaled them. They were absolutely amazing!!!!!!! 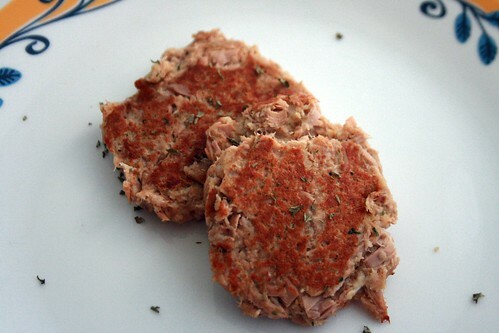 I make tuna cakes quite often. I like to add old bay seasoning (homemade) and dijon mustard. I’m gluten free so I substitute dry potato flakes for the bread crumbs. I usually serve them with baked grits and coleslaw.